This special cure is known as the "Mm Harng Charn", or better translated to become the PRODUCTIVE 5 ELEMENT CURE. It had been derived from the principles of 4-Pillars of Destiny and the controlling-producing cycle of 5 Elements. Feng shui masters from authentic schools would commonly remedy all directional problems with 5 Element Method. But the wiser ones will further apply the boosting method based on the productive cycle to maximize the remedy. That being the reason why those with feng shui eyes will be able to see this powerful application all over asian countries that built their cities with Feng Shui. The PRODUCTIVE 5 ELEMENT CURE is the most effective cure for almost ALL situations. Those who are familiar with the popular five element pagoda will probably see these pieces as individual elements dismantled from it. Yes, that is correct in a way. These are a set of 5 individual pieces made from crystals and shaped according to their elements. And 5 elements are the basis and fundamental of where all cures and enhancers were derived. 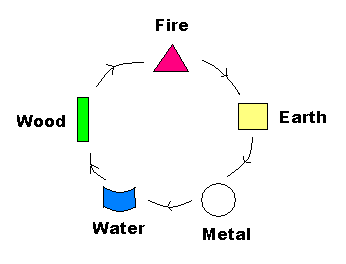 The following shows the productive cycle of 5 Elements where fire produces earth, earth produces metal, metal produces water, water produces wood and wood produces fire. When the productive cycle is used, it gives the "boosting" effect. Shar chi is in the North - The energy of shar chi is water element. One should display the cure in the following sequence facing North to exhaust water energy. Straight line set up to cure the north. The yellow glaze square box facing north. Shar chi is in the Northwest and West - The energy of shar chi is metal element. One should display the cure in the following sequence facing Northwest and West to exhaust metal energy. Straight line set up to cure the northwest or west. The triangular red glaze facing northwest or west. Shar chi is in the Southwest and Northeast - The energy of shar chi is earth element. One should display the cure in the following sequence facing southwest and northeast to exhaust earth energy. Straight line set up to cure the northeast or southwest. The rectangular green glaze facing northeast or southwest. Shar chi is in the South - The energy of shar chi is fire element. One should display the cure in the following sequence facing south to exhaust fire energy. Straight line set up to cure the south. The curvy blue glaze facing south. Shar chi is in the Southeast and East - The energy of shar chi is wood element. One should display the cure in the following sequence facing southeast or east to exhaust wood energy. Straight line set up to cure the southeast or east. The spherical white glaze facing southeast or east. When to use the Productive 5 Element Cure? a. Internal physical shar refers to overhead beams, pillars, odd shape spaces, toilet etc. b. External physical shar refers to tall trees, pylon, lamp post, power station, sharp roof edges, incoming roads, construction sites etc. 2. Intangible Shar Chi - Cannot be seen, but can be derived from formulas. Bounded by time dimension or not bounded by it. a. Affliction and shar that changes with time - Natal Chart problems, Annual Chart problems, 3-Killings, Tai Sui, Sui Po etc. b. Affliction that is fixed according to 8 Mansions formula depending on the facing direction of a house - Five Ghosts, Six Killings, Total Lost etc.